If you have an event but no one produces any evidence of it, did it really happen? 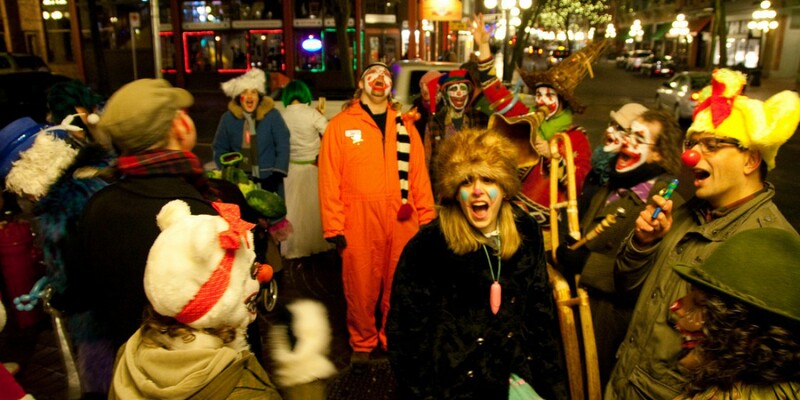 Way back in December, on the 15th, we had us a Clown Parade. Just now, the pictures are in. Give me a bit to do some processing, and we’ll have us some real evidence of flying monkeys activity. Stay tuned. This photo stitched together from two (of a delightful great many) by the inimitable Claire Yargeau. Yayyyyy!!!! Oh, you’re still here? Did you notice my fancy new ‘Merchandise’ button?